Colors: Black, White, Brown, Blue, Agouti, Chinchilla, Opal. Sooty Fawn, Siamese Sable, Orange, Fawn, Steel and Butterfly (white on underbelly, chest, feet and nose, leaving one of the above colours on the back, ears and a distinctive butterfly marking on the head). 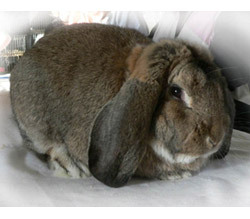 The French Lop is a very large rabbit, weighing more than 4.5 kg with lop ears and an almost cubic appearance with a short thickset body and large head. The front legs are short and straight and the hind legs are carried parallel to the body.